Soonafter sunset, as the sky gets dark, look toward the south and you?llimmediately notice the brilliant planet Jupiter, but there's another night skytarget that also promises a great experience: the amazing Andromeda Galaxy. Jupiteris a great starting point to find the AndromedaGalaxy. After you find the bright planet, look high above it ? almostdirectly overhead - to find four bright stars. These are the Great Square ofPegasus, the Winged Horse, an unmistakable star pattern, even though it isslightly battered out of true square shape.? Interestingly,the star in the upper left corner of the Square ? Alpheratz ? actually belongsofficially to the constellation Andromeda. Andromeda, according to legend,should be chained to a rock.? Instead she seems to have become chained to thehorse: a double strand of stars ? one strand bright, the other dim ? connectedto the upper left corner of the square.? Aboutmidway and above these star strands is the Andromeda Galaxy, one of the mostamazing and fascinating of sky objects. It can be seen faintly with the unaidedeye, but binoculars and small telescopes promise better viewing. 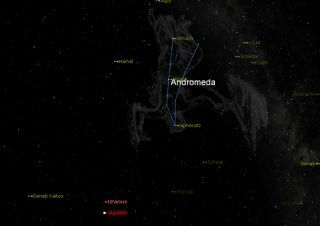 Thissky map shows whereto look to see the Andromeda Galaxy over the next week, though clear weather isvital to spot it. Inthe year 905 A.D., the Persian astronomer Al Sufi drew attention amidst thestars of the Andromeda constellation to a "Little Cloud," which appearedon star charts long before the telescope was invented in 1609.? Ifthe sky is clear and moonless you can indeed see an elongated hazy patch withyour unaided eye about as long as the width of the full moon and half as wide. Throughbinocularsand telescopes it remains an elongated patch which gradually brightens inthe center to a star-like nucleus. It was listed as object number 31 in CharlesMessier?s 18th century catalogue of galaxies,nebulas and star clusters,which is why it is known as Messier 31 or M31. We know it better as theAndromeda Galaxy.? Thebest way to positively find theAndromeda Galaxy is to focus your eyes or binoculars on Alpheratz. Runstraight across to the left and get the star Mirach in your field of view.? Thenrun slowly upwards to a fairly bright star above Mirach and continue to run upin roughly the same direction and same distance. You?ll immediately take noteof a little patch of faint light. ? Pleaseforgive this patch of light for being so faint and tired looking. It's amazingto realize that, as you see it tonight, this light has been traveling some 2.5million years to reach you (give or take a few hundred thousand years),traveling all that time at the tremendous velocity of about 671 million mph ?the speed of light. Thelight from that "Little Cloud" is actually the total accumulation oflight from over 400 billion stars. Asyou look at the Andromeda Galaxy tonight you'll be doing something that no oneelse in the world except a stargazer can do: You will actually be looking backinto the distant past. Thelight you are seeing is around 25,000 centuries old and began its journeyaround the time of the dawn of human consciousness.? Whenit began its nearly 15 quintillion(that's 15, followed by 18 zeros! )mile journey earthward, mastodons and saber-toothed tigers roamed over much ofpre-ice-age North America and prehistoric man struggled for existence in whatis now the Olduvai Gorge of East Africa. TheAndromeda Galaxy is the most distant object that can be seen with the unaidedeye. M31has been estimated to be nearly 200,000 light-years in diameter, about 1 1/2 timesas wide as our own MilkyWay galaxy. Its bright nucleus is the hazy patch that is visible to theunaided eye.? Likeour own galaxy, M31 has several attendant satellite galaxies. Two of these: M32and M110 can be picked out with low magnification in a small-to-medium sizedtelescope, in the same field of view as M31.? Fora very long time, M31 was popularly referred to as the Andromeda"Nebula." Althoughbig reflecting telescopes, such as Lord Rosse's 72-inch telescope at BirrCastle in Ireland, were in operation during the mid-19th century, it was notseen clearly until 1924,when astronomers Edwin Hubble and Milton Humason used the 100-inch reflectingTelescope at Mount Wilson Observatory to become the first persons to resolveM31 into individual stars. "SirJohn Herschel ? concludes that it is a flat ring, of enormous dimensions, seenvery obliquely. It consists probably, of myriads of solar systems at a mostastounding distance from ours, and affords a distinct lesson that we must notlimit the bounds of the universe by the limits of our senses."? Thisgalactic neighbor of ours, the Andromeda Galaxy, is the nearest of all thespiral galaxies to us and one of the largest known. Joe Raoserves as an instructor and guest lecturer at New York's Hayden Planetarium. Hewrites about astronomy for The New York Times and other publications, and he isalso an on-camera meteorologist for News 12 Westchester, New York.